Editor’s Note: Welcome to issue #2 of the RiskHedge Report, a weekly advisory dedicated to helping you profit from today’s disruptive trends. Every Thursday you’ll receive a valuable essay from Chief Analyst Stephen McBride. Although this is a free subscription, he won’t hold anything back. You’ll get Stephen’s top investment ideas and find out the exact stocks he’s buying with his own money. If you missed issue #1, you can read it right here. This morning, I placed an order to buy gold with my broker at $1,275/oz. 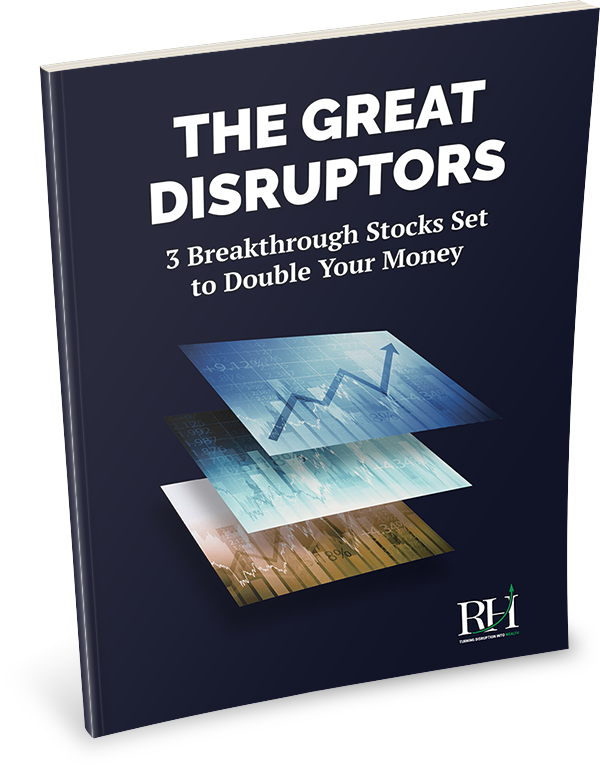 As I explained last week, my goal in this letter is to help you profit AND protect yourself from disruption. Buying gold is in the “protect yourself” category. This year the U.S government will spend $4.4 trillion. And as you likely know, the government spends far more dollars than it “earns” by extracting taxes from you. This year it’ll borrow $835 billion to cover the shortfall. When you add that to its existing debt pile, it owes a staggering $21.5 trillion… making the US by far the most indebted entity in history. This pile of debt is more than 7x what the government takes in each year. It will never, ever be repaid. So, instead of repaying its debts, the US government inflates away its obligations by quietly killing the US dollar. Let’s say it borrows $835 billion this year and promises to pay it back in 10 years. If inflation runs at 2% per year, it only has to pay back the equivalent of $682.2 billion. While this is a sweet deal for the government, it is bad for you and me. It means our savings are being eaten away. With 2% inflation, $50,000 in the bank will only be worth $45,200 in 5 years. Which leads us to an important question: If you know your hard-earned savings are decaying every year… why would you hold it all in dollars? This is why I store some of my savings in gold. 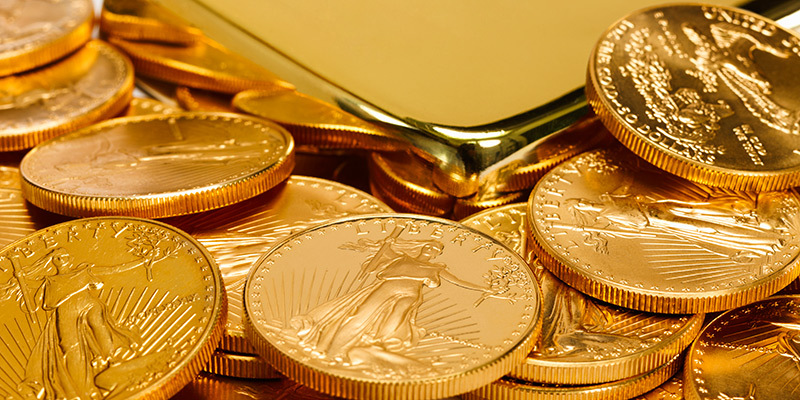 Unlike the US dollar, gold is an excellent store of wealth. In his 1977 study The Golden Constant (updated 2009), Roy Jastram showed just how good gold is at protecting wealth. Jastram looked at inflation records and the gold price going back to 1560 for the UK. And back to 1800 for the US, France, and Germany. The study found gold held its value not just over decades, but centuries. It protected the value of people’s savings during times when the value of their currencies fell to zero or near zero. This is because no central banker or politician can “print” gold like they can paper currency. We can separate money into two categories. There’s money you spend, and money you save. You should put some of your savings in gold. This is money that would otherwise sit in your bank account and get eaten away by inflation. Then there are dollars you need for spending… to pay your mortgage and buy groceries. Like it or not, we need US dollars for spending money. You’ll get nothing but a confused look if you try to hand a gold coin to the cashier at your local grocery store. We need dollars for everyday use, but they’re a terrible place to put your hard-earned savings. The bottom line is, if you keep all your savings in dollars, you’re trusting your financial future to politicians. That’s like trusting a drunk with your whiskey. 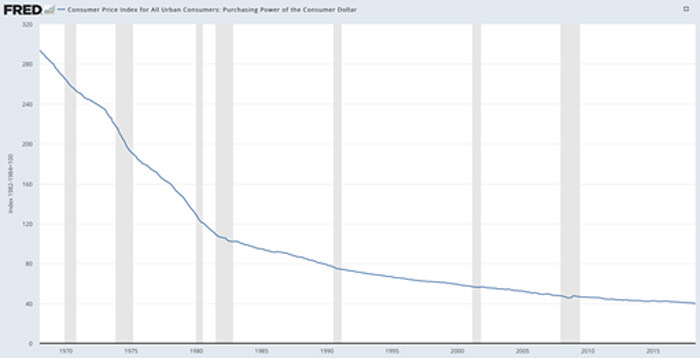 By the government’s own numbers, the value of the dollar has declined by 86% in the past 50 years. This chart from the St. Louis Federal Reserve Bank shows its decline. Would you own that if it were a stock? By holding some of your savings in gold, you’re taking back control of your finances. Politicians can’t “inflate” away the value of gold. That’s why gold has held its value for thousands of years… while most paper “monies” since the Roman Empire have gone to zero. In this weekly letter we’re going to cover lots of breakthrough technologies with the potential to make us a lot of money. There are incredible things happening in crypto money, self-driving cars, virtual reality, and clean energy, to name a few. But to profit from these disruptive trends, first we must protect what we have. We need a reliable store of savings that’ll hold its value before we deploy it into disruptive opportunities. This is why I own gold. Well, fully self-driving cars are on US roads today. Waymo is the self-driving car subsidiary of Alphabet, Google’s parent company. Their robo-taxis are driving people around Phoenix, Arizona. Bringing kids to soccer practice. And their parents to work. As Abby, a Waymo user said in an interview: “You hear about how one day cars will drive themselves. Oh, it’s today, right now.” Here’s a picture of Abby and her family with a Waymo car. It has travelled 6 million driverless miles on US roads. It would take the average American 300 years to drive that much. All Waymo’s robo-taxis run on one central “brain.” It learns from every mile driven, and every Waymo car learns from the experiences of every other Waymo car. Which means Waymo’s driverless cars are already far more experienced on the roads than any human driver could ever be. Later this year, Waymo will launch the world’s first driverless ride-sharing service. At first, its robot cars will only operate in Arizona where the roads are straight and there’s not much nasty weather. Pause and take that in. Driverless cars will be hauling Americans around later this year. This is a huge breakthrough that not many people are talking about. The company tested its service with 600 Chrysler Pacifica minivans like the one in the above picture. To support the full launch of their ride-sharing service, they ordered 62,000 cars. This is a massive investment. For perspective, there are around 14,000 New York City yellow cabs. In the next year, Waymo will have a fleet of robo-taxis that’s 4x bigger. Driverless cars were a fantasy 5 years ago… so how are they on the roads now? It comes back to what we were talking about last week… computer chips. To get around safely, a driverless car must see, understand, and react at least as fast as a human can. There can be no delay in its “thinking” whatsoever. Seeing a cyclist an instant too late could be fatal. This means the car’s computer, its “brain,” must process millions of pieces of information every second. Intel is the world’s largest computer chip maker. It supplies many of the high-powered chips in the “brains” of today’s driverless cars. Waymo has been using Intel chips since 2009. Last August, Intel went all-in on driverless cars when they bought Mobileye for $15.3 billion. Mobileye makes the cameras, sensors, and software that enable driverless cars to detect what’s around them. Their new EyeQ5 chip makes the “brain” in every Waymo car 210% more powerful. With this chip, the robo-taxis will have the power to think and process what’s going on around them as fast as a human driver. And that’s why EyeQ5 is one of only a handful of chips to be awarded the highest classification of auto safety. Which means cars running on this chip can be on the roads without a human in the driver’s seat as backup. A “fully driverless” car. Intel is now partnering with Waymo to build the entire system for their new driverless fleet. While this accounts for only a fraction of Intel sales today, I expect it to grow quickly. Because right now, self-driving cars make up 0% of the $285-billion-a-year US auto market. But if we fast-forward 10 years, I expect there will be tens of thousands of driverless cars on American roads. If you think that’s far-fetched, remember Uber didn’t exist 10 years ago. Now there are 4x as many Uber drivers in New York as there are yellow cabs. Uber, by the way, wants most of its cars to be driverless in a few years. And that’s because there’s a lot of money to be made with them. Today, self-driving cars are where the internet was in the early 1990s. The first websites had just been launched but only a fraction of Americans had internet in their homes. Investors made truckloads of money over the next 5… 10… 20 years as the internet spread like wildfire. What do you think about self-driving cars? Would you ride in one? Are you investing in them?